A folding rail, which folds up when not in use, as to not cause a trip hazard at the bottom of the stairs. 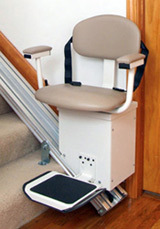 A comfortable contour seat that swivels and locks at 60 degrees or 90 degrees away from the top of the staircase and lets you get on or off the stair lift with confidence. The padded armrests, which make your ride much more comfortable, fold up and out of the way - giving you extra space to get assistance when you need it. A state-of-the-art operating control switch can be placed on either side of the seat for your ease of use - and an optional joystick, hand-held pendant or button controls can be used by those with limited hand mobility. Access at the touch of a button with our wireless remote control, so your stairlift will always be exactly where you need it! A compact design that folds up to a tight 14” from the wall when not in use.